Opinion: What will top food sustainability agenda in 2019? You are here: Home » Farm-to-Fork News » Agriculture » Opinion: What will top food sustainability agenda in 2019? Food company chief executives will begin 2019 with two reports on the outlook for the UN’s climate agenda fresh in the memory. Responding to the threats climate change poses to their businesses has clearly been a defining factor in food companies’ sustainability strategies for years. However, these two reports suggest the coming year will see a renewed focus by food manufacturers on climate-related risk and reducing greenhouse gas (GHG) emissions. A report from the UN’s Intergovernmental Panel on Climate Change (IPCC), published in October, offered a downbeat view of current and prospective progress towards the goals agreed under the Paris climate accord three years ago. Limiting global temperature rise this century to 1.5°C above pre-industrial levels is still technically feasible, the IPCC’s report states, but would require “rapid and far-reaching” transitions in land, energy, industry, buildings, transport and cities. Global net human-caused CO2 emissions would need to fall by around 45% by 2030 against a 2010 baseline to put the world on track for only a 1.5°C temperature rise. A continuation of current trends, on the other hand, is likely result in global warming of around 3°C by the end of the century. A further report from the UN Environment Programme (UNEP), published in November, estimates the level of ambition in Nationally Determined Contributions (NDCs) will have to increase by a factor of three to keep global warming below 2°C and fivefold to achieve the more ambitious Paris target of only a 1.5°C rise. The report points to the contribution companies can make beyond their own quantified emissions reductions, notably in pushing for more ambitious national goals. It is interesting to note that only the day before the UNEP report was published, James Pearson, the chief executive of Danone‘s operations in the UK and Ireland, and (now outgoing) Unilever CEO Paul Polman joined with other business leaders in signing a letter urging UK Prime Minister Theresa May to adopt a net-zero target for 2050. Prominent multinational food companies were vocal advocates of UN action on climate change prior to the Paris deal being signed and are likely to resume that role if resolve is seen to be flagging. Food companies themselves may face greater scrutiny in the coming year in relation to their own emissions targets, notably in relation to Scope 3 (indirect) emissions generated by the production of agricultural raw materials. With around 80% of GHG emissions associated with food production generated by agriculture, Scope 3 emissions for food manufacturers represent a significant proportion of their total emissions. While for some years major food companies have been broadening their sustainability outlook to address impacts and risks throughout the value chain, measuring those impacts is a far greater challenge, particularly in relation to distant and complicated agricultural supply chains. Prior to launching a new report aimed at helping food companies take on this challenge, US-based sustainability non-profit Ceres conducted a survey of 50 of the largest US food and beverage companies and was surprised to find that only 15 disclosed Scope 3 GHG emissions. Meanwhile, just eight of the companies, Coca-Cola, Danone, General Mills, Kellogg, Mars, Nestle, PepsiCo and Unilever, report on Scope 3 emissions and have also set explicit reduction targets. While Ceres was looking only at US-based companies, it believes this pattern would be reflected among large food and beverage concerns globally. The number of tools available to help food companies measure Scope 3 emissions has increased significantly over recent years, and as a result many more food companies will be expected to address this challenge. Many of these tools are available online at no charge which should help boost Scope 3 emissions target-setting among food SMEs. The IPCC estimates agriculture accounts for around 25% of global GHG gas emissions and driving down emissions from agricultural emissions has been identified as a critical component in the reduction of emissions overall. Meanwhile, Scope 3 emissions will allow companies to demonstrate the contribution sustainable agriculture programmes are making to GHG emissions reduction, in addition to primary aims such as improving yields, boosting farmer incomes and underpinning the security of supply. By the same token, greater transparency on Scope 3 emissions will highlight the higher environmental costs of animal agriculture and aquaculture, which could be challenging for companies sourcing large volumes of meat, poultry and fish. 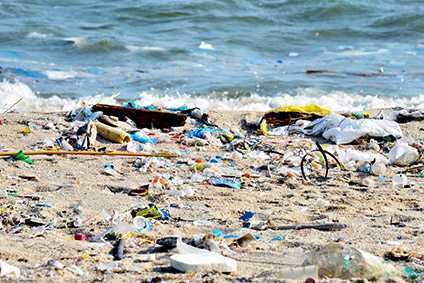 Given the media attention marine pollution caused by plastic has attracted over the past year or so, the use of plastic packaging is certain to be a major area of focus for food companies in 2019. However, for the food companies that have signed up to the New Plastics Economy Global Commitment to eliminate plastic waste and pollution at source and establish a circular plastics economy, campaigner pressure may abate a little in the coming year. Food manufacturers that have not signed up, however, can most definitely expect pressure from environmentalists to increase during the coming year. In spite of the increased public traction the plastics issue has gained, campaigners have continued to focus their attention primarily on major soft drinks and bottled water brands. But, with the four principal target companies all signed up to the New Plastics Economy commitment, now may be the moment when campaigners make a clear tactical switch to target the food sector on the plastics issue. For companies that have signed up to the commitment, addressing the logistical and technological challenges that enhanced commitments on sustainable plastic packaging present will be a key sustainability priority during the coming year. For example, sourcing sufficient volumes of packaging made from recycled content can be difficult in countries where recycling rates are low and recycling infrastructure is under-developed. Sustainable plastic packaging is an issue-laden area for food companies. While the commitment does not include an endorsement of extended producer responsibility (EPR) as a policy tool to finance recycling infrastructure development, campaigners believe EPR is vital in building the infrastructures required to establish the circular economy for plastic the commitment envisions. Other issues likely to be the subject of considerable debate as food companies seek to increase their use of sustainable plastic packaging are the use of bioplastics and the degree to which reducing plastic packaging and reducing food waste represent competing priorities. With regard to diet and health, there is likely to be an increased focus next year on the marketing of foods high salt, fat or sugar (HFSS). The UK government is expected to introduce restrictions on price promotions and in-store merchandising of HFSS foods and a 9pm watershed for TV advertising next year as part of the second phase of its childhood obesity strategy. However, it would not be a surprise to see this put back until a little later in the year given that it will only have completed consultations on these issues by the turn of the year at the earliest. Reformulation will continue to be in the spotlight too, with the second progress report on the government’s sugar reduction programme due to be published in March. Last year, UK food producers fell well short of the 5% year-one target, only achieving a 2% sugar reduction across the nine food categories included in the reduction programme. This year saw governments in India and Saudi Arabia engage on a voluntary basis with food companies to encourage reformulation to reduce salt, fat and sugar levels in food products, suggesting growing support for this type of initiative. With obesity a major public health issue in so many markets, the launch of further programmes of this type can be expected. For the last decade or more, sustainability has steadily risen up the corporate agenda for food manufacturers. While the investment community once had a very sceptical view of sustainability, recent years have seen investors become more engaged on key sustainability issues, not least because of closer associations between key sustainability issues and risk. How investors view sustainability could in itself represent a critical issue for food companies over the coming year. While investors today are more persuaded by key sustainability issues like carbon, water, packaging and supply chain security than ever before, some clearly believe the likes of Polman and Danone CEO Emmanuel Faber have taken the purpose-led approach to running their companies too far, at the expense of shareholders. “Too much planet and not enough profit” might be the cry. Faber recently came under fire from equities analyst Martin Deboo, who suggested the Frenchman’s “missionary zeal” was threatening to overwhelm “more prosaic goals”. Polman has always attracted criticism along similar lines, while at the same time being lauded by those who share his vision of conscious capitalism. The Unilever CEO is stepping down on 31 December (to be succeeded by Alan Jope, the head of the FMCG giant’s beauty-and-personal-care division), a move that ranks among the significant sustainability-related events in the food sector of 2018. Even those who take issue with his ethos, would pay tribute to him as an industry champion who has had a profound impact on how food companies do business.